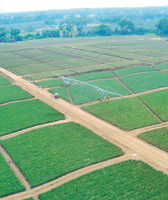 T-L Linear irrigation systems, available from John's Pump Service, share the same hydrostatic design features as our pivots and can operate from a furrow, above-ground cable or buried wire. Water can be supplied from ditch, or hose-drag sources. You can make your choice, hard or soft hose in sections up to 660′ and a variety of diameters to fit your application.